Is there such a thing as BUI: Blogging Under the Influence? If so, I plead guilty with an explanation. In fairness to you, dear readers, our very strict standards of quality control require each of us here at TheArmenianKitchen.com to taste ALL recipes. True confession: I (Doug) am the drinker in the family. I like a wee taste of Scotch before dinner. And, on occasion, a glass of wine with the main course. But truly, only a taste -- and only on occasion. But special occasions demand special consideration, and nothing is more special than a visit with our daughter, Mandy, the toast of the New York City arts scene. One such visit, about three years ago, brought us to a very trendy bar in Greenwich Village, where we sipped away an hour or two while waiting for a table at the even-trendier restaurant next door. I ordered the usual: Dewar's, rocks. Robyn, being more adventurous, asked the bartender to recommend something special. The bartender's reply, with no hesitation: A pomegranate martini. We took this as a sign. Pomegranate is a most Armenian fruit, almost mythical in meaning. I immediately switched my order. These days, pomegranate martinis are as wildly popular as, well, apple martinis. Or chocolate martinis. Or pretty much any other fruit, candy or vegetable attached to the word martini. Most have little connection to the traditional gin-and-vermouth concoction except for the shape of the glass. 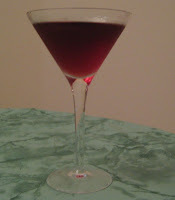 But the typical pomegranate martini is lacking the most essential ingredient: Pomegranate juice. I've learned to ask for an ingredient list before ordering one, because they're often made with some sort of (allegedly) pomegranate-flavored syrup mixed, which is UNACCEPTABLE. Luckily, I persuaded the bartender to share the recipe for the drink that got us hooked. Here it is, strictly in the interest of sharing an Armenian-influenced favorite that remains popular on the American scene. WARNING: Do not attempt to blog, much less drive, after imbibing. Pour ingredients over ice in a martini shaker. I like this blog more all the time! if necessary, add more vodka! I can now say, having tasted and tested this recipe as prepared in the actual Armenian Kitchen -- or rather, to be perfectly accurate, the bar adjoining The Armenian Kitcen -- that a pomegranate martini is one excellent concoction. For that extra extra shot of pomegranate, make it using Pearl pomegranate vodka. Or why compromise on the quality of the vodka? Use a good vodka like Grey Goose, Crystal, Belvedere, etc., and substitute pomegranate liqueur for the juice (www.pamaliqueur.com). In that case, decrease the amount of liqueur to 3 oz (if you want to increase the vodka to 9 oz, well I am certainly not going to talk you of it! ).